These days, more and more Richmond food trucks are planting roots with their own brick and mortar spots. Happy Empanada recently set up shop in Westover Hills, mobile Texas-style BBQ truck ZZQ expanded with a huge location in Scott’s Addition, and fried chicken truck Mean Bird opened their shop near Sticky Rice last spring. Adding to that list is Peddler on Pine Street, a new takeout, and delivery spot dishing out pizzas, paninis, pasta, and hoagies. Opening just a few months ago, the shop will be the answer to all your munchie needs, that is, if you can even spot it, as it’s tucked away on the backside of Fine Food market on Idlewood Avenue, in a small space with a tiny gravel parking lot. 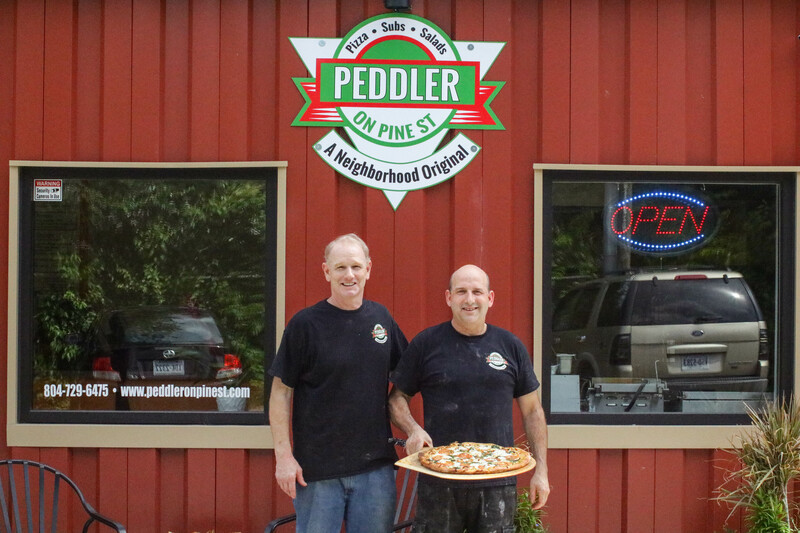 Owners Mike Powers (left) and Kelly McCabe (right) opened up Peddler on Pine Street March 21, but the two are no strangers to the fast and ever-changing food game in town. “After coming together in 2011, we opened up our three Peddler food carts down in MCV. Mike had done all the footwork before we got together, getting the real estate and all. I then added my culinary expertise and we opened up Discovery Cafe in the Library of Virginia about six years ago,” said McCabe. 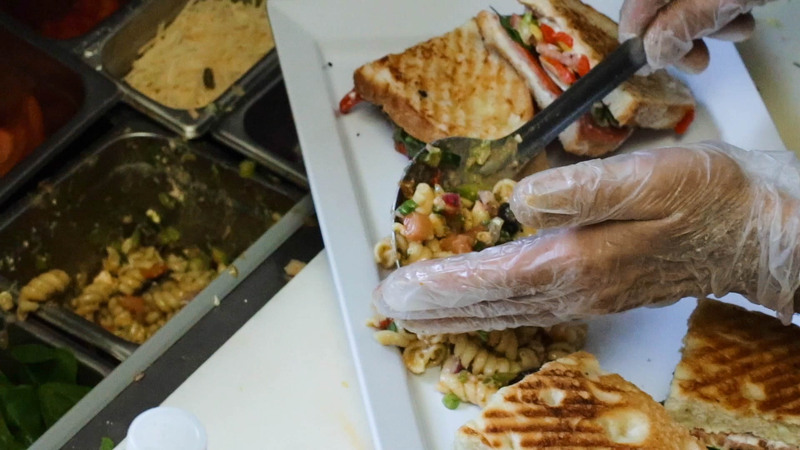 The two entrepreneurs, along with McCabe’s wife Catherine and over 10 other employees, run the food carts Mike’s, Taqueria Mexican Grill, and Toastie’s Panini Grill downtown, along with the Discovery Cafe. McCabe was originally an executive chef for the Philip Morris headquarters back in 2003 when they moved from New York to the West End. He then ran food service for SunTrust from here to Fort Lauderdale until partnering with Powers. 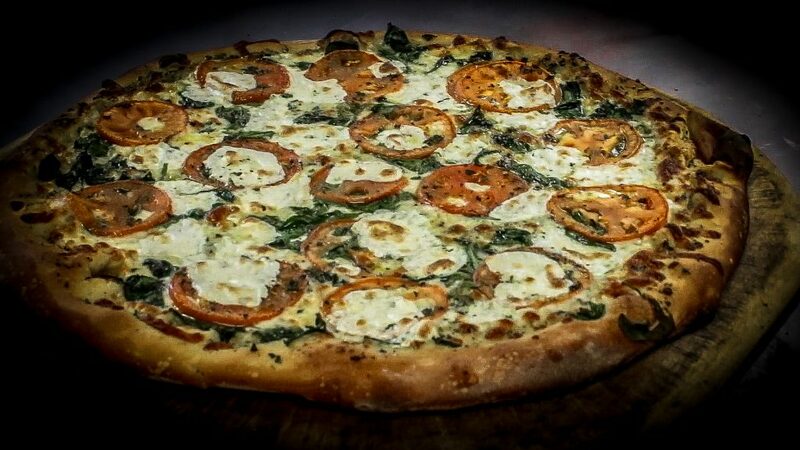 And with their new joint, they’re firing up hand-tossed pizzas like the Blanco, Margherita, Caprese and buffalo chicken along with Italian staples like lasagna, penne ala vodka, and baked spaghetti. Of course, cheese steaks and chicken parm sandwiches also grace the menu. “I want to be known as the local, entrepreneurial, animal, and neighborhood-friendly takeout joint where you can come on down and have some homemade hot sandwiches and pizza made right in front of you for an affordable price, ” he said. Everything is made from scratch, from the sandwich bread to the sauces, to their potato chips. “I don’t want anyone to have to put anything extra on top for taste,” said McCabe. 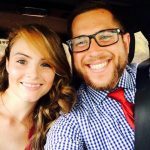 RVA Mag had a chance to try are their Caprese pizza, chicken pesto panini, and steak and cheese. Since then, I have ordered two of their buffalo chicken pizzas, which they deliver to my house for $2.00. Next on my list is their margarita shrimp pizza, screw Uber eats for this one. To me, nothing says Oregon Hill more than a take-out joint selling pizza for $2.00 a slice, look out Christians. The menu is going through some change right now, the owners plan to drop about half their pasta entrees and replace with different types of barbecue. 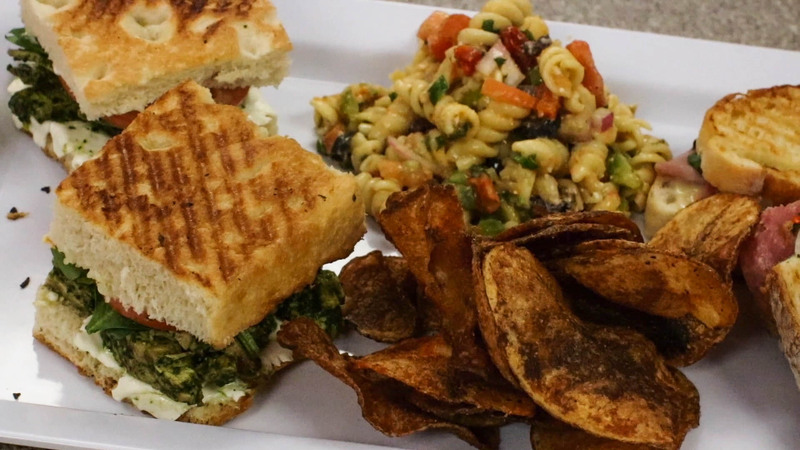 It’s quite obvious this panini and pizza shop is driven by the passion of running a local business and immersing themselves in the local community, not to just make money and keep up with the demand of their food trucks. Since their opening, the two said they are averaging just around 700 customers a day. As for the future, they hope to extend the outside with picnic benches, and a tent to make it dog-friendly for patrons. 238 S. Pine St.